An easy Baked Swai Fillet recipe in a delicious White Wine Lemon Garlic Sauce – great for weeknights and for feeding a crowd at a dinner party. If you can’t find swai, you can make this with tilapia instead. This recipe contains affiliate links. See my disclosure. I brought this baked swai dish to a recent family dinner at my aunt’s house, and I wanted to share this super simple recipe with you! If you have never heard of Swai, it is one of my favorite fishes, and I really hope you get to try it! (I like saying ”fishes” – it’s a fun word!). 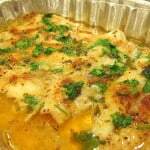 Swai tastes very light and is not too fishy, and cooks very quickly because the fillets are pretty thin. It is also much more affordable than a lot of other seafood. This means it shows up on our dinner table quite often! All of these reasons make Swai perfect for a large dinner party – you won’t be breaking the bank, and even people who don’t like fishy fish might enjoy this dish (say THAT 5 times fast!). Plus swai is so easy to cook, it’s perfect for when you have lots of other recipes to worry about in the kitchen. Where do I buy swai fillets? Swai is typically sold in the frozen packaged seafood section of your grocery stores. Major brands such as Orca Bay sell swai, but you will also often find no-name-brand packages of swai in the same freezer section. Can I use tilapia instead of swai? 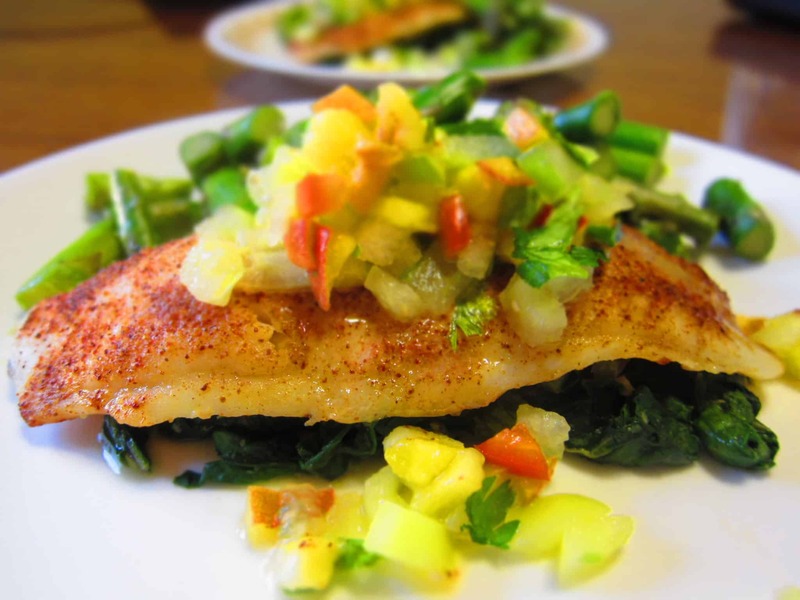 Yes, you can absolutely use tilapia instead of swai in this recipe. Just follow the instructions exactly the same way. The only precaution is that tilapia fillets are typically a little smaller than swai fillets, so you can use 8 tilapia fillets if you’re looking to serve a larger crowd. How do I cook swai? 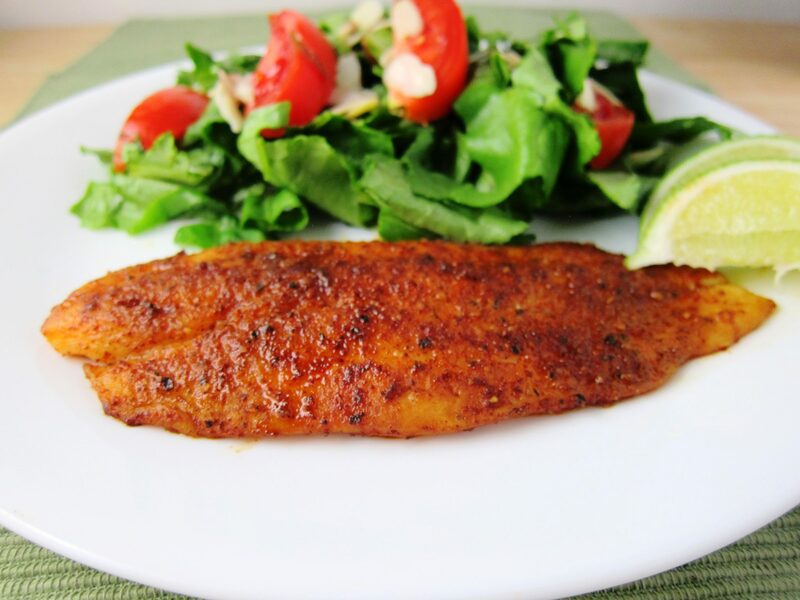 Just like most seafood, Swai fillets tastes GREAT with a bit of lemon or lime. So in this recipe I bake the swai in a delicious garlicky sauce made with lemon juice and white wine. It’s such a tasty, delicate flavor that really works well with white fish such as swai. 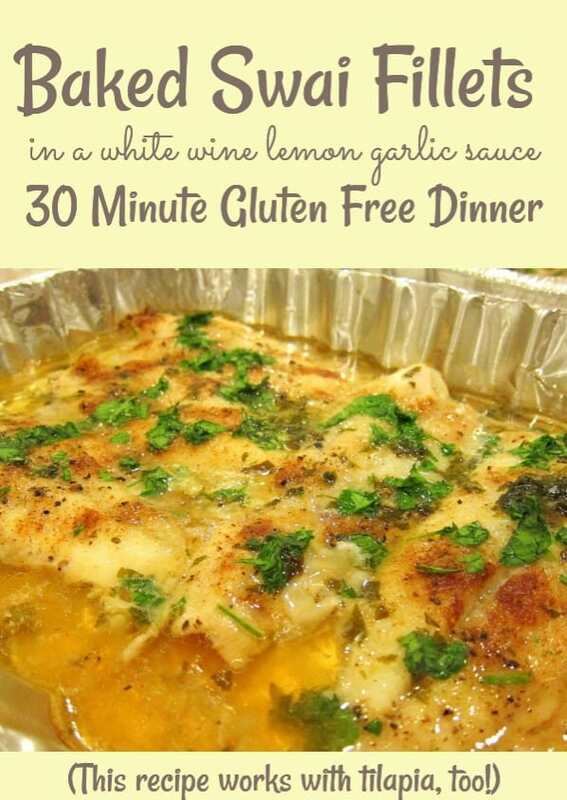 The White Wine Lemon Garlic Sauce can be made in advance. This makes the prep & cook time is very quick when it’s time to bake the swai fillets. 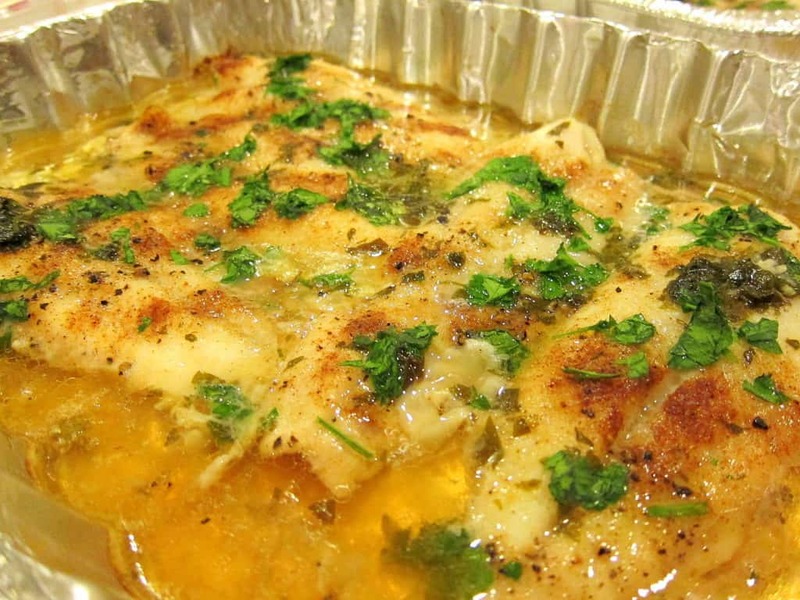 Just pour the sauce over the swai fillets in a baking dish, and pop it in the oven. 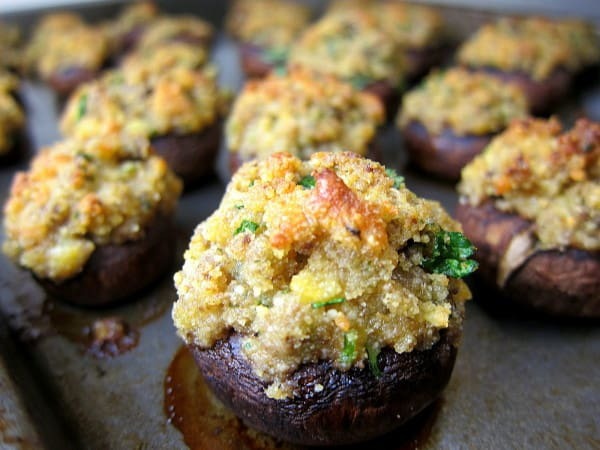 You’ll need a large baking pan for this recipe, such as this one here. Or if you don’t want to mess with washing fishy dishes, you can use disposable aluminum baking trays such as these. Just make sure your baking pan has high sides, so you don’t accidentally spill the delicious sauce. You’ll want to use the freshest ingredients to make this sauce. 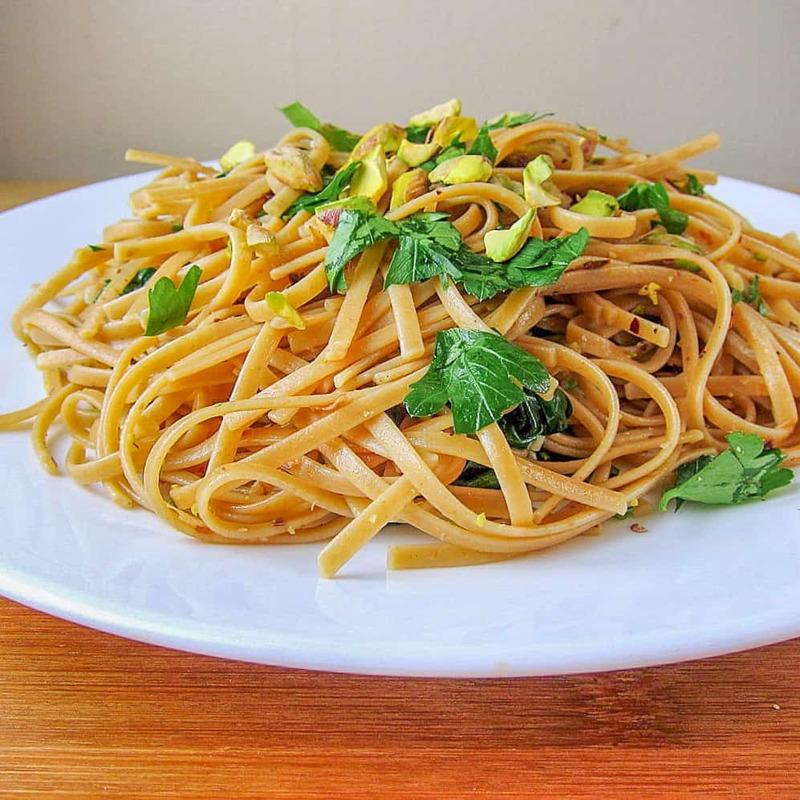 Using fresh lemon juice, fresh parsley, and fresh garlic will give the sauce the most flavor. It’s worth taking the extra minute or two to prepare these fresh ingredients instead of using bottled lemon juice or dried garlic or parsley. Fresh lemon juice. Freshly squeezed lemon juice has a much brighter, more vibrant flavor than the bottled stuff. And as a bonus, there are no preservatives whatsoever! I use this lemon squeezer to squeeze lemon halves in just a second or two. Fresh parsley. Fresh herbs add so much flavor and a beautiful color to most dishes, so I always try to use fresh when I can. These herb scissors are kind of fun to use and definitely take the pain out of chopping herbs. Fresh garlic. One of the first things my mom got me when I moved out on my own is this garlic press that she loves. 13 years later, it’s still going strong in my kitchen and I use it pretty much daily. 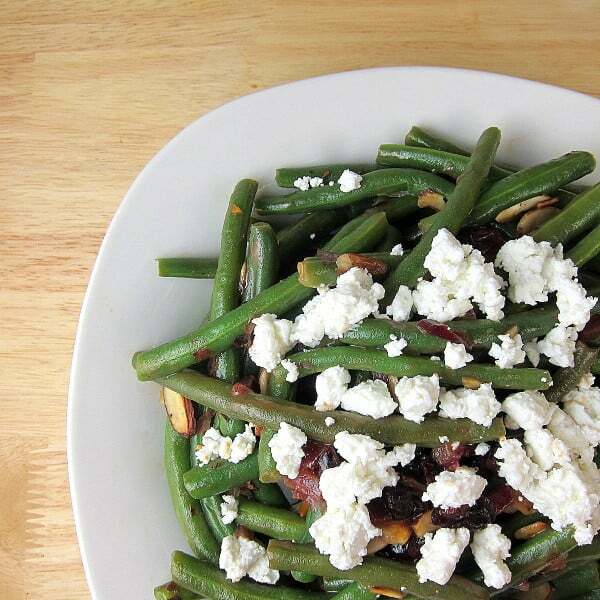 This is a great recipe for serving a family or serving a crowd. It is so easy to bake swai in a large baking pan without having to fuss over each individual fillet. You can also easily double this recipe if you wanted to. It would also go great with a piece of crusty bread to soak up the delicious white wine sauce. 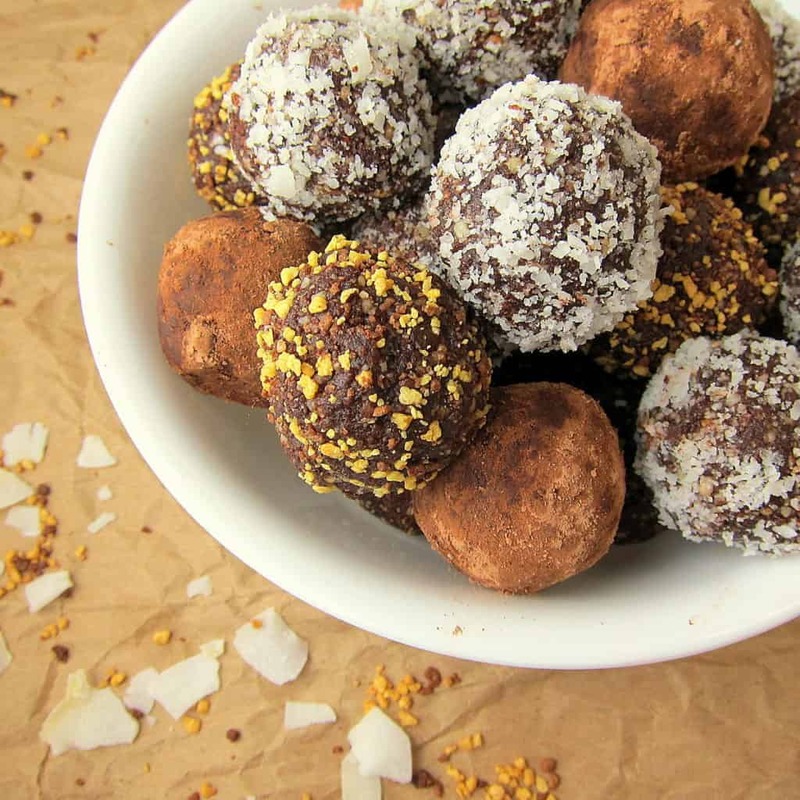 If you enjoyed this swai recipe, please let me know with a comment and a star rating below. And don’t forget to save it on pinterest for later! An easy Baked Swai Fillet recipe in a delicious White wine Lemon Garlic Sauce - great for weeknights and for feeding a crowd at a dinner party. Preheat oven to 375F. Grease a large baking pan. Arrange the swai fillets in the baking pan. Season with a tiny bit of salt, pepper to taste, and paprika. Pour the white wine sauce over the swai fillets. Sprinkle with half the fresh parsley. 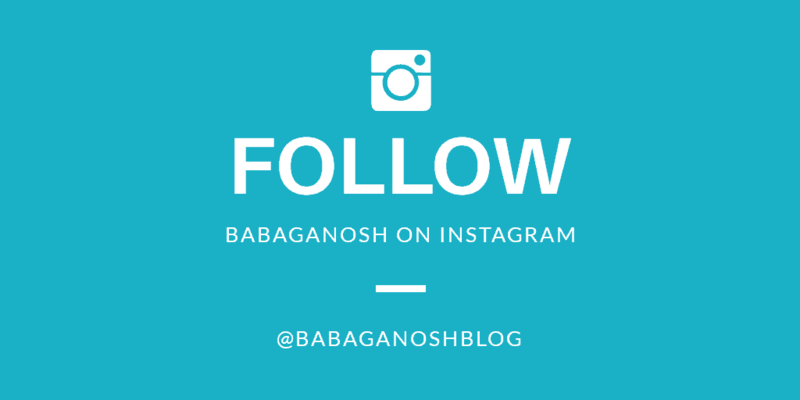 If you enjoyed this recipe, don’t forget to follow me on Instagram! 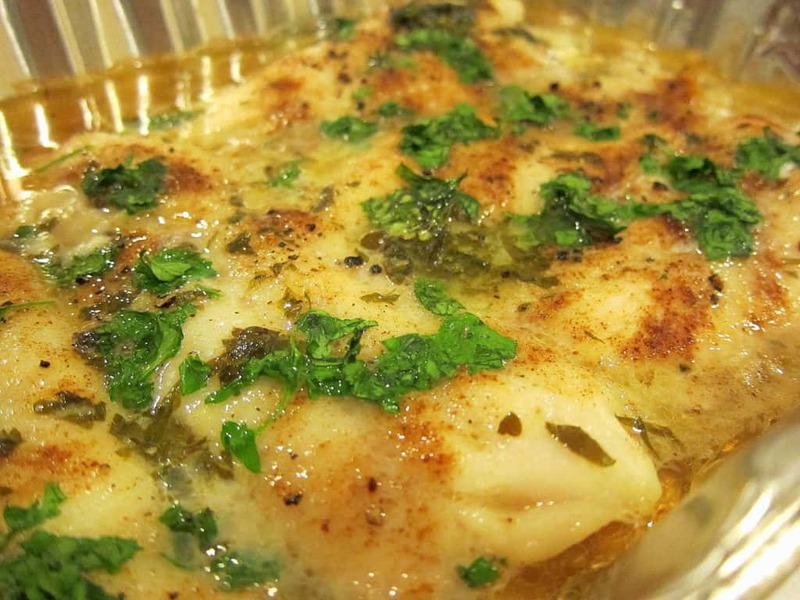 Don’t forget to save this Baked Swai Fillet Recipe on Pinterest! 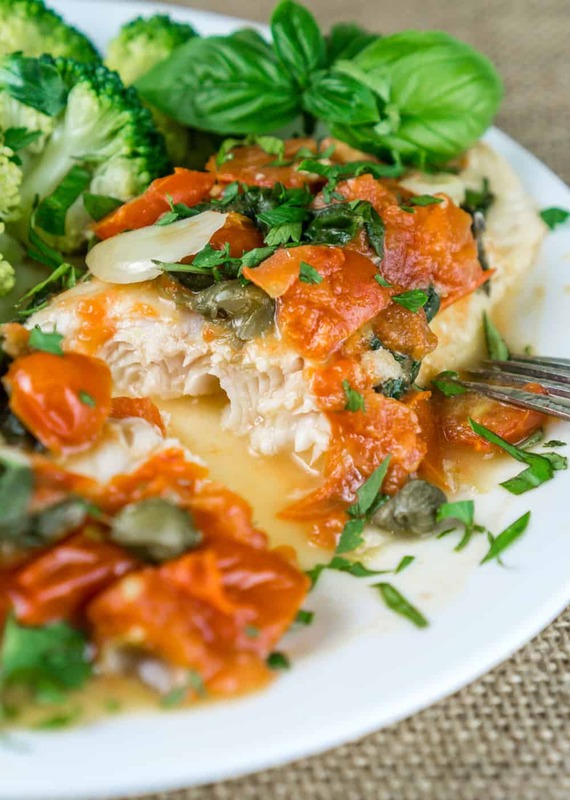 Swai Fillets with a Tomato Caper Sauce. Get the recipe here. That dish might be missing all the serving ware that we’re used to seeing on your photos but the recipe totally makes up for it. Aw, thanks Maureen. This was definitely very good and more importantly, so easy! Hi Kate, I especially like your Swai dish topped with the peach tomatillo sauce. 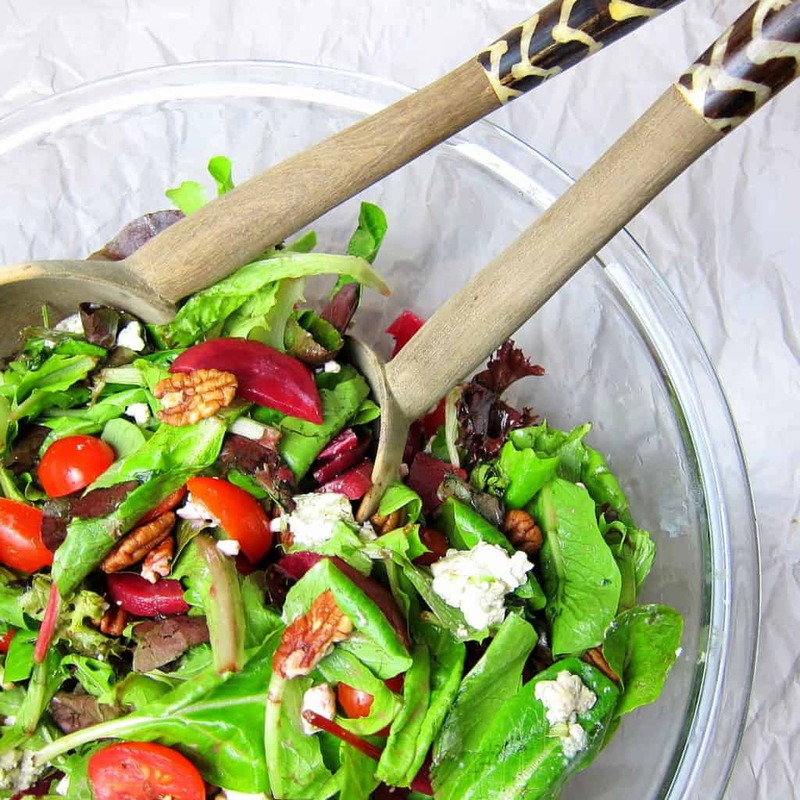 The layering with the chard gives a lot of color and texture to the dish. Happy New Year! The Swai with the peach tomatillo salsa is also my favorite out of the three 🙂 But I was cooking for some members of my family (ahem, grandma) who don’t like anything new or exciting when it comes to food, so I had to stick to a more classic sauce without anything on top or on the bottom. I made this Swai with white wine and garlic sauce, the entire family loved it. I had a few swai and a tilipa fillets and both were delious !! I just made this and it was delicious! I added capers, which gave it a nice change in texture. I’ve never made swai before and this seemed like a good starter recipe. I can’t wait to try your chili lime version. The first time I tried this, I used some moscato that I’d gotten at a good sale price and wasn’t too fond of for drinking, but it sure made the fish taste awesome! I’ve made it a couple of more times after that and it’s always a hit with my family! I also often use wine that is not great for drinking to make this – usually a bottle that I didn’t finish drinking, it’s perfect for cooking!